Erik Allen Schnaser, M.D. is a fellowship trained and Board Certified hip and knee replacement surgeon. He specializes in adult hip and knee disorders including pre-arthritic and arthritic conditions. He has a special interest in patient specific instrumentation, surgical navigation, robotic surgery, as well as taking care of and revising patients with failing or failed total joint replacements. His surgical skill set includes but is not limited to total hip replacements, total knee replacements, partial knee replacements, knee arthroscopies, total hip revisions, total knee revisions, and lower extremity traumatic injuries. 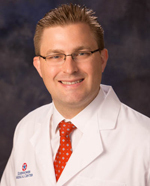 Dr. Schnaser is originally from Carson City, Nevada and is the son of an orthopedic surgeon. He received his Bachelors of Science in Biochemistry at the University of Southern California and then attended medical school at the University of Nevada School of Medicine. He then completed a surgical internship and an orthopedic surgical residency at Case Western Reserve School of Medicine. Following his residency, Dr. Schnaser completed a fellowship in adult hip and knee reconstruction at the Hospital for Special Surgery in New York City. Dr. Schnaser is particularly interested in researching clinical outcomes after hip and knee replacements. He believes that patient specific instrumentation, navigation, and robotics have the potential to increase patient satisfaction and clinical outcomes following joint replacement surgery. He has given over 20 national and international presentations stemming from his research, has author several peer reviewed publications, and has written book chapters on the subject of joint replacement surgery. He was a member of the America Academy of Orthopaedic Surgeon’s Research Development Committee and has spent time on Capitol Hill in order to ensure that the Nation Institutes of Health continues to receive research support for musculoskeletal conditions. Anterior Total Hip Replacement Surgery…What’s the hype? Where: The Annenberg Center for Health Sciences.